During this year’s 47th Annual Legislative Conference also known as Congressional Black Caucus week held at the Walter E. Washington Convention Center in Washington D.C. September 20-24 , U.S. Senator Kamala D. Harris (D-Calif.) held a press conference call to discuss her first nine months in office. 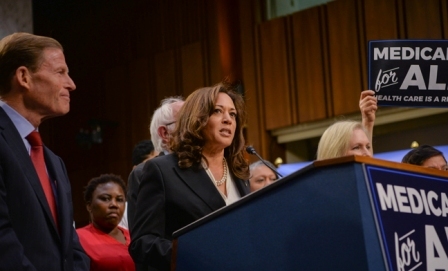 Harris discussed civil rights, health care, immigration, and her work to support Cali­fornia’s African-American community. This was the first Congress­ional Black Caucus convention for Harris as Senator, as conversation and concern loomed as Republican Senators attempted for the second time a new Graham — Cassidy healthcare bill. While we asked the Senator about her co-authoring of the Bernie Sanders Single Payer Healthcare Bill she cautioned black journalist to stay focused on the current challenge of keeping Obamacare the law of the land. “It is about saying that healthcare is a right for all, not a privilege for a few”, Harris stated. 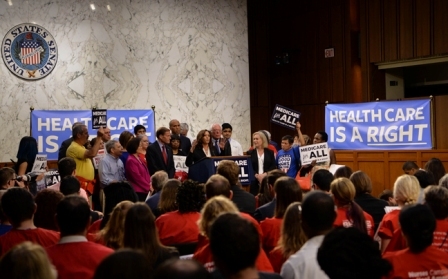 The Act would ensure that Americans will no longer have to delay or avoid going to the doctor because they can't afford it; that a hospital stay will not bankrupt you or leave you deeply in debt; that you will be able to get the prescription drugs you need at a price you can afford; that middleclass families will never have to spend 20 or 30 percent of their incomes on health care; and, that Americans will save billions of dollars a year in medical administrative costs. Marshall, about a young Thurgood Marshall, the first African-American Supreme Court Justice, as he battles through one of his career-defining cases. The film stars Chadwick Boseman, directed by Reginald Hudlin and is set to hit theatres October 13.